A quick note: some images have larger or alternate views. Click (or tap) on them to see it. Identifying American Pottery Look at the Bottom! Have you ever wondered why some people turn every piece of pottery over and look at the bottom? Maybe you thought they were emptying the contents or dusting the shop! 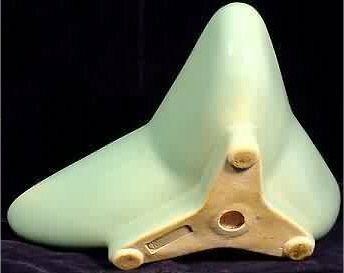 Well, some of the pottery lovers like myself have spent years identifying American pottery, and one of the best ways to do this is by looking at the bottom of the piece. 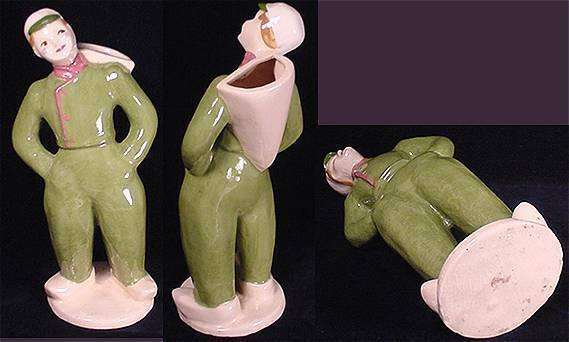 In most of the American pottery pieces, the bottom tells more than the glaze. 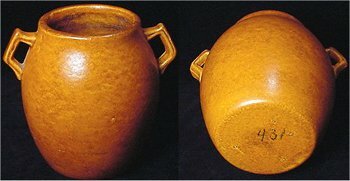 The bottom shows the name, if there is one, the color of the clay, the way the piece is fired, and other characteristics that help with the identification. If you're looking to identify a piece of marked pottery, you may want to check our American Pottery Marks and Resource Directory and compare the mark there. If you pick up a piece of pottery and it has identifying marks such as a name or logo, you can easily determine the maker. This is wonderful, but not always available. See the Frankoma pitcher, right. Since not all pottery is marked, the identification must be done with a little more resourcefulness. The best identifier I have found for determining if an unmarked piece of pottery is American made is the heft of the piece. Most American pottery pieces have some weight to them–unlike the Japan imports of the 1940s, 1950s and 1960s that seem fairly light in comparison. This	is a good place to start to identify the country of origin, if it is not shown. So, just in the process of picking up the piece, the	weight is registering in my mind. This is something that has to be developed over time. It is not that any piece over a certain weight is American pottery–it is the relationship between the size and the weight that helps determine the country of origin. The American pieces feel like they have "heavy bottoms" and often the walls are thicker than Japan and other foreign potteries. The clay color is the first thing I see on the bottom of any piece of pottery, and certain colors can identify the maker. It is essential to look for an unglazed area to determine the clay color. 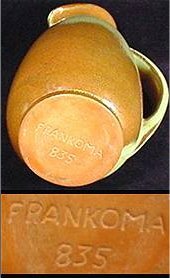 For example, you probably know that Frankoma was made with a red clay for many years. Look at the feet on the Frankoma leaf (left). 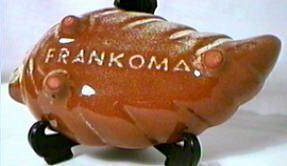 Frankoma was also made with Ada and a pink clay. Ada clay was a yellow beige and was earlier than the red clay pieces. Note the bottom on the Frankoma piece (right). Blue Mountain pottery of Canada is usually made of red clay, is often unmarked and looks and feels much like American pottery. 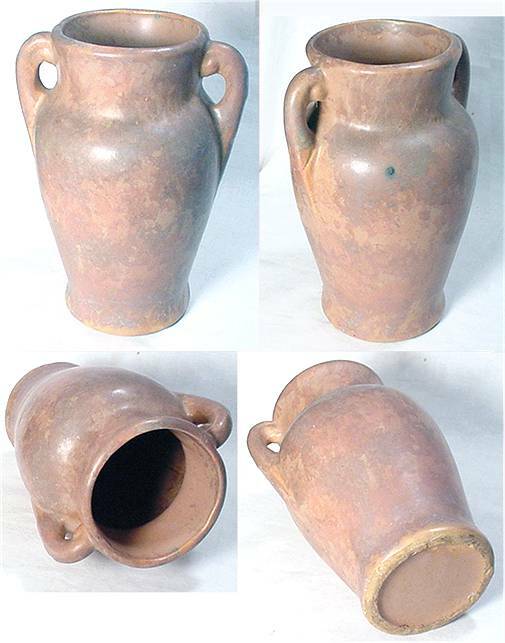 Early Peters and Reed pottery was red clay, too, as were many of the Arts and Crafts pots like Grueby. 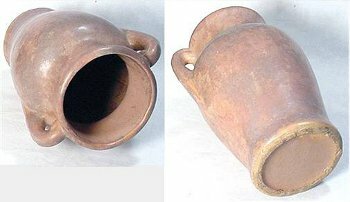 Some Italian and Mexican pottery is made with red clay, and much of the southwest or Native American pottery uses shades of red. Harris G. Strong used red clay sometimes, too, and Nicodemus is a red clay pottery. 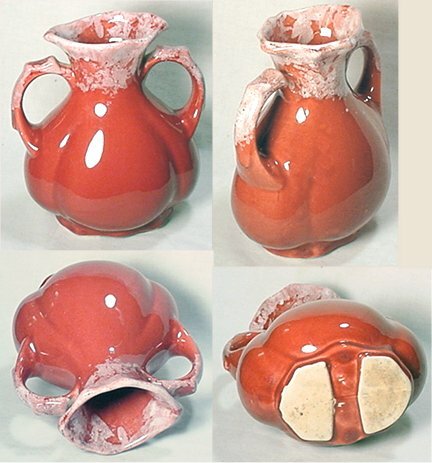 Jugtown is often red clay, and there are some North Carolina potters who used red clay. See this red clay dish by Harris G. Strong (left). Georgia, Alabama, and North and South Carolina have available veins of red clay that are suitable for pottery, so consider makers in those geographical areas if you have a red clay pot to identify. Of course there are lots more, but if you have a piece of pottery with a red clay base, this is a start. There are many different shades of "red" clay, but red and deep pink clays have been readily available to the potter for centuries, and this color often gives the glaze a different look than it would have with another color clay. 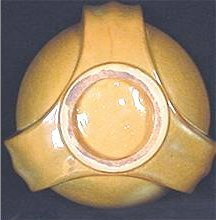 Yellow clay was primarily from Ohio, so most of the Ohio potteries used yellow clay. Roseville, McCoy and Brush are examples of the yellow clay potters. For an example, see the yellow clay bowl produced by McCoy (right). Robinson-Ransbottom was mostly yellow clay. Watt Pottery is in a class I call yellowware, since they used a clear glaze over the yellow clay instead of colors. Robinson-Ransbottom, Blue Ridge, Purinton, Watt all made some yellowware with a clear glaze over the yellow clay. 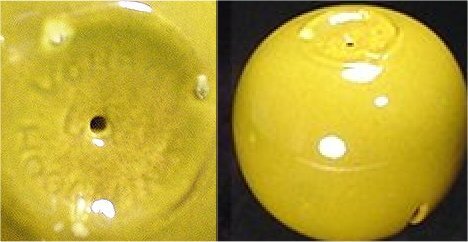 Take a look at the Watt Pottery yellowware bowl (left). 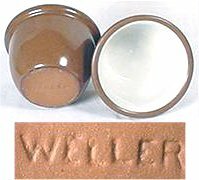 Weller sometimes used yellow to cream colored clay, but just when you think you have learned how to identify these pots by clay color, an anomaly shows up. Look at this Weller piece in red clay! Hull and Shawnee are a cream color with a pink tint to the clay. So are American Bisque and Royal Copley. 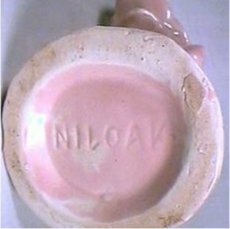 Don't confuse this with pink clay–used by Coventry and Kay Finch and a few other California potters, including some Hagen-Renaker. See how the pink clay Dutch boy (left) has a pink clay color so his face, base and backpack don't require additional paint? Camark and some Arkansas potteries as well as Texas potters used a white to ecru clay, primarily. 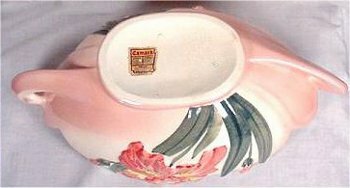 See the dry foot on the Camark console bowl (right). Niloak is often white clay, and much of the Niloak was heavier with a wider foot (left) or base than many other American potteries of that era. 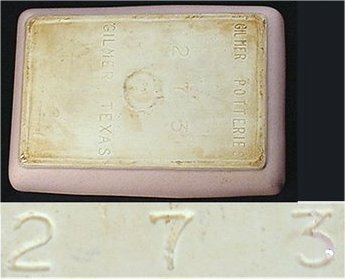 Alamo and Gilmer are Texas potteries using white clay. See the white clay base (right). Stangl Pottery is often made of a white clay, too. Some Hawaii pieces are also white clay, like this Hawaiian pitcher on the left. 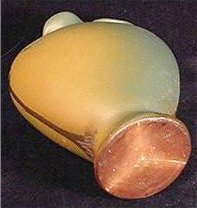 Beige clay was used by Rosemeade and some eras of Dryden, primarily Kansas Dryden. 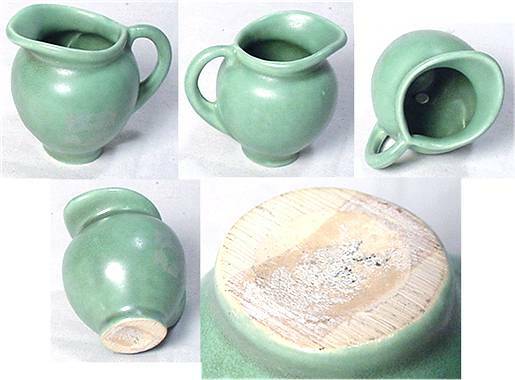 This green Dryden pitcher (right) shows the beige clay clearly. 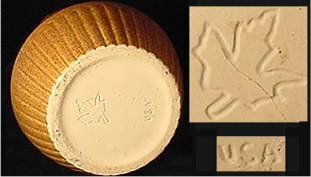 Monmouth (which later became Western Stoneware) used a sandy clay, often seen with a maple leaf and USA incised into the clay. If you examine a pot like the sandy jug (left), you can quickly recognize the clay and maple leaf. Some of the southwest Native American pottery is beige clay, too. 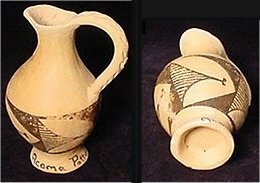 This pitcher (right) is marked Acoma on the side. Mosaic Tile made pieces that were not tiles, and they often have a beige clay. See the odd boomerang ashtray (left) by Mosiac Tile. 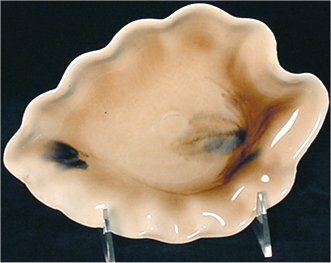 Heath used a sandy clay for much of its dinnerware lines. Dryden and Rosemeade may be sandy clay, too. This Heath bowl is clearly marked, but notice the clay color on the unglazed ring. Any pottery that has been soaked in water may be beige, too, so beware of dirty bottoms! Many pieces of pottery have a dry rim around the bottom edge, known as a dry foot. 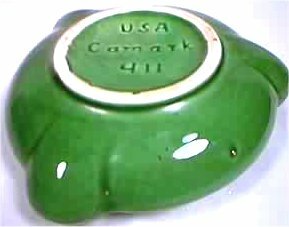 This green Camark ashtray (right) has a white unpainted rim. Others have a completely dry or unglazed bottom, and still others have wedge	shapes on the bottom. Royal Copley frequently used bars across the bottom. 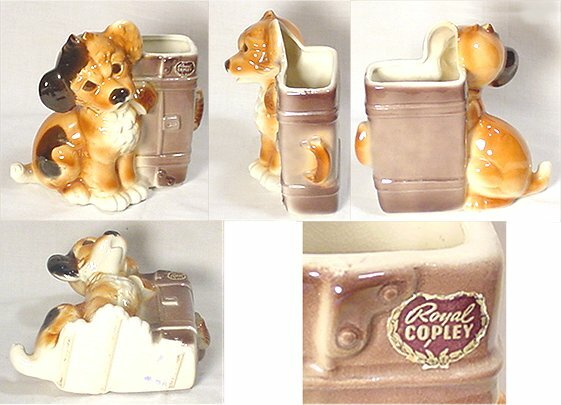 Note the bars across this Royal Copley planter (left) from the manufacturing process. American Bisque used the wedge shapes routinely, so that is always my first guess on a piece with a dry wedge foot. Here's a good example of the American Bisque wedge foot (right). Companies using a dry foot include most of the Ohio companies and some Stangl of New Jersey. Several companies used stilts for glazing pottery, and the bottom will be glazed over completely with three small marks for the stilts. Haeger and Royal Haeger are often glazed like this. Stilt marks (left) may look like damage at first, but are a good distinguishing feature. There are also some California potters who used stilts or firing pins for most of their glazing. Metlox was one California pottery using firing pins. Notice the three flaws on this Metlox pitcher (right), indicative of firing pins. 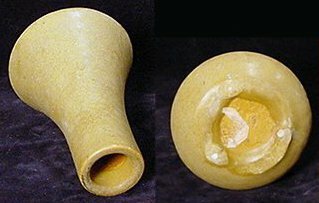 Vohann is another example of a glazed bottom with firing pins. These stilt marks (left) can help you establish the maker of this bowl. RedWing (also RumRill) and Stangl used stilts for some of their ware lines. Take a look at the marks on this RumRill console bowl (right). Peters and Reed often has three stilt marks, too, and the old pieces show red clay under the glaze. So, if you see three little flaws on a glazed bottom, these are not damage–they are stilt marks or firing pin marks used for the firing process. Examining the bottom for stilt marks may reveal some numbers that may help with identification, too. For many years, three numbers were used to identify many of the shapes for American pottery. Some companies only used two numbers for some of the shapes, and some used four. These are numbers that are in the mold, not handwritten. Just a glance at the foot shows the numbers on this McCoy or Brush pot (left). Notice the tilt to the numbers? 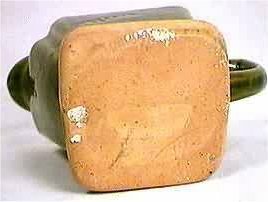 If you see three numbers at a slant on a yellow clay pot, it may be Brush or McCoy. RedWing and RumRill are routinely marked with numbers, and sometimes the name. Some of the pieces were also marked with a letter, a dash, then a number – so items marked similar to "M-3333" are often Redwing (Murphy Era). Three square numbers on a white pottery bottom may be Alamo Pottery, made in San Antonio, Texas from about 1946-1952, or it may be Gilmer, another Texas pottery in business for much longer. Notice the block style to the numbers on this Gilmer vase (right) made with white clay. Remember to look at Camark and Niloak, too, because they used a white clay for much of their production. Note the difference,	though. Alamo and Gilmer often have a completely unglazed bottom, while Camark and Niloak may have just a dry foot. 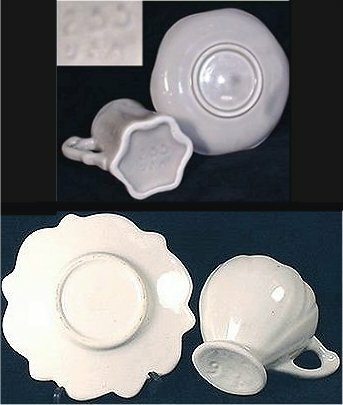 Compare these cups and saucers (left) with the Gilmer vase (above). The way the numbers are written, the style of number and even the number of numbers are all significant in determining the maker of a piece of pottery. It is that combination of details that help the pottery enthusiast to determine the maker. 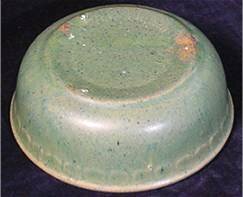 This article is about the identification of American pottery by the bottom, and it is not my intent to vary from that topic much, but it is difficult to look at the bottoms and not see the tops–so a comment on glaze seems essential here. 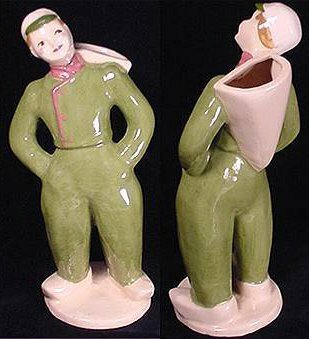 The glazes in pottery went with fashion of the day, and trends can be noted, although there are lots of exceptions. The era of standard glaze–the shiny brown finish used by Weller, Loy-Nel-Art, Peters and Reed and Rozane–was at the turn of the Twentieth Century. sgraffitoScratching the surface to create a graffiti design. with pastels, predominated the next 15 years or so. (More information through this link to Wikipedia.) Think Rookwood and Newcomb. By 1915, much American pottery was matte finish and early Art Deco shapes. This continued through the 1920's. 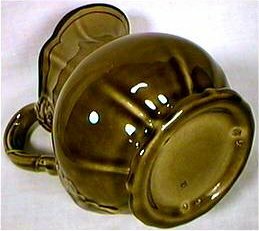 Some American potteries went	back to shiny glazes in the late 1930s and 1950s, and through the 1960s for many of the companies. Much of the newer Roseville, not reproduction but 1960s era production, was a shiny glaze, but this started as early as 1937 with Ivory II production. Roseville, for one, had both shiny and matte patterns side by side for many years. By 1947, most of their lines had gone to shiny glaze. The same general dating can be used for Hull, Weller, and other American companies of the first half of the Twentieth Century. In general, shiny glaze has not met with the same favor by collectors as the	matte glaze pieces. This is probably most evident in Van Briggle and Rookwood. The shiny pieces do not sell for the premium prices of matte glaze pieces. 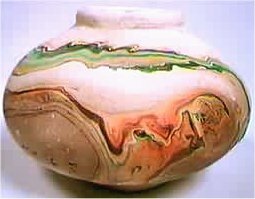 Some companies typically made certain colors and styles of glazes. 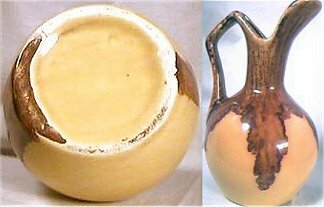 Winart Pottery made a drip glaze, such as the glaze on this Winart pitcher (right), that identifies much of their wares. Notice how the glaze looks incomplete. Guppys Island Ware of California used a drip glaze, shown by the glaze on the outer rim of this plate (left). 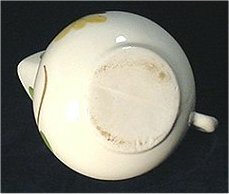 Drip glazes were also common in Fulper, Stangl, and Zanesville pottery. 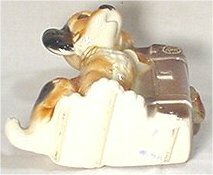 Morton pottery made lots of drip glaze pots and figurines, and it is becoming collectible. Crystalline glazes were done in early Camark and early Haeger, like this pot by Haeger marked 431 (right). Notice how the glaze has depth of color in shades from orange to brown? There are some contemporary studio potters making glazes with large crystal formations in the glaze – but these early production works were small crystals. Note how large the crystals in this glaze (left) are — this is a contemporary piece. Lava or foam glazes were common in VanBriggle and Haeger – the most recognized being Bennington Brown Foam by Haeger. 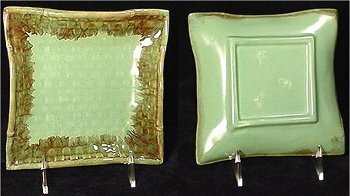 These are a type of drip glaze, but are bubbled at the top and do not form the “drips” of drip glazes. Mottled glazes were most often made by Ohio potters–Burley-Winter, McCoy and Zanesville come to mind. A good example is this McCoy vase with a mottled glaze (right). Camark used a cutting tool that left what I call "saw marks" on the dry foot of their pots. I have been able to identify several Camark pieces instantly by the saw marks — take a look at this Camark creamer with saw marks (left). Nemadji has a distinctive look, done almost in mission style like the swirl clay potters. Scrutinize the swirl patterns on this Nemadji pot (right), you'll notice how this is similar to Native American pottery. 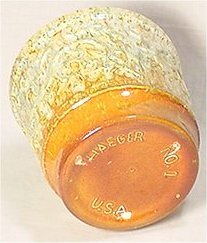 Haeger often looks as if it has a "seam" in the middle of the glazed bottom, and that helps in the identification of any Haeger or Royal Haeger that is not otherwise marked. 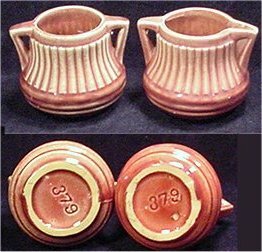 Some Weller has a distinctive three-part seam at the bottom, like this Weller vase (left) where the seam is clearly visible. Purinton may have a seam with an unglazed foot. This Purinton Pitcher (right) has a faint seam on the base. Some Dryden has a flat unglazed bottom, and that, along with the sandy clay helps identify older Dryden, even if the mark is not readable. Vitreous china was made by many of the American potters, and it is best known as restaurant ware. It is usually white clay with a very hard, high-fired finish. Much of the Alamo and Gilmer pottery is vitreous, pottery fired at a high temperature in the kiln. Mosaic also did vitreous with a white or sandy clay and hard shiny glaze. This pottery is difficult to chip or break, and feels like bathtub porcelain. It is usually very heavy, almost the weight of stoneware. Vontury of New Jersey was also high-fired pottery, and much of the Vontury is done in pastels with impressionistic nature scenes. View this Vontury leaf bowl (left), for example. Most Vontury is marked, but the name is difficult to read unless you know what it should be. 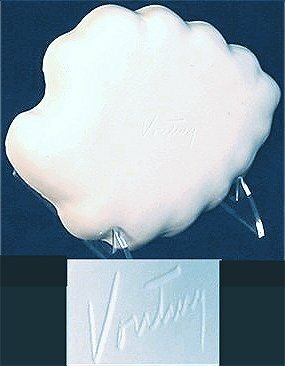 Here's a look at the Vontury mark (right). Handles were often elaborate on Fulper and Stangl and sometimes Dryden and Morton. Camark had some intricate handles as well. Most of the Floraline McCoy line was very plain, Art Deco style pottery, made for the florist trade. 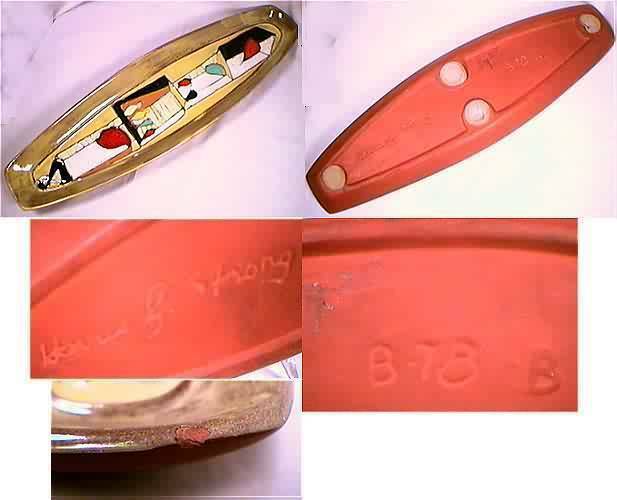 Hyalyn also made Deco style pieces, and often they had cork bottoms, like this cork-bottomed ashtray by Hyalyn (left). What I call "sloppy" pots were made by Burley-Winter, Zanesville and sometimes McCoy. These had a glaze that ran down over the edge of the dry foot, oftentimes not trimmed. VanBriggle did some of these, too, but most of the VanBriggle pottery is marked and not difficult to identify. Notice how the glaze dripped over the bottom in this Van Briggle "sloppy" pot (right). When looking at a piece of pottery, learning to combine the information here will be the most helpful. Check the weight, then the bottom. Check the color, then the design of the bottom – whether a dry foot, flat bottom, wedged base, ridged bottom or stilts. Then, identify the piece by style, glaze, or some other identifier. Confirm your conclusion by checking in a book or the internet. Once you have done this for a few years, you will develop confidence in your	skill. This is just a lightweight review for identification of unmarked American Pottery. Maybe it will encourage you to try your luck at identification of	pieces on your shelf or in the collectibles malls. It may also give some insight into why some people pick up pottery and check out the	bottom. They aren't dusting the shop, or emptying the spiders (or crickets in Texas). They are looking under the pot for answers! Happy hunting for American Pottery! See our other articles on pottery. 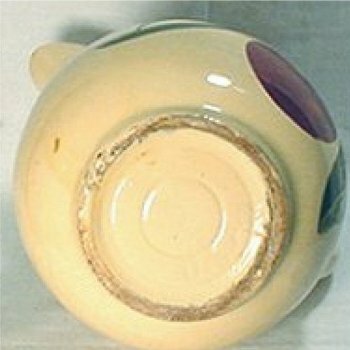 About the Author: Linda H. Richard has been collecting American Pottery for twenty years, and has been an ISA Appraiser for ten years. She is currently pursuing other interests and is not an active appraiser with the International Society of Appraisers. She has contributed to several books and articles. Her husband, Darrell, does the photography and design work for her pursuits. Learn about antique and contemporary pottery jewelry by potters like Frankoma and Rosemeade and modern artists such as JoAnn Duban.